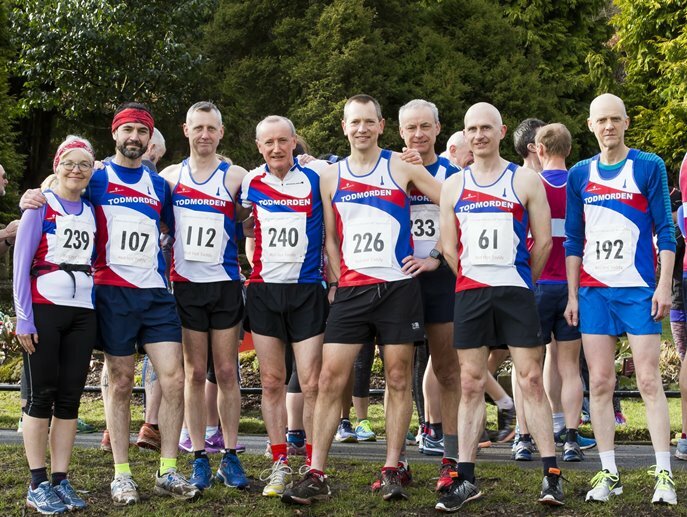 Todmorden Harriers put on a great show with their own local road race event on Sunday. The 10k race was organised by Sue Copley for the club who made sure that preparations were pieced together with meticulous detail with some great support from other club members leading up to the event, as well as the logistics on the day. This tough local race takes in two laps of Todmorden’s Centre Vale Park before taking runners up a tough long climb up Ewood Lane to meet the valley tops at Sourhall Road. Once this climb is out of the way the race is largely downhill to a fast finish back at the Park. Before the main event, the 1 mile fun run saw 50 participants enjoy the route on a mixture of terrains within the park grounds. The first to finish was U11 Seth East completing the course in a great time of 6.56, just a whisker in front of U11 Bea Wigmore in 6.59. In the 10k, John Raho of Holcombe Harriers won in a speedy 38.46 just ahead of local resident John Lloyd of Salford Harriers in 39.07. First woman was Halifax Harrier April Caufield in 45.06. Matt Flanagan put in an impressive display to finish 5th overall in 41.05, taking the 1st v45 position. Next to finish for the Harriers was Jonathan Mitcham in 42.17 for 9th overall and clinching 1st v60 prize. Mark Anderton also claimed the v55 prize finishing 31st in 46.49.